Europam sive Celticam veterem. Sic Describere conabur Abrahamus Ortelius - Janssonius, J. Title : Europam sive Celticam veterem. Sic Describere conabur Abrahamus Ortelius. Size : 13.9 x 18.4 inches. / 35.3 x 46.8 cm. 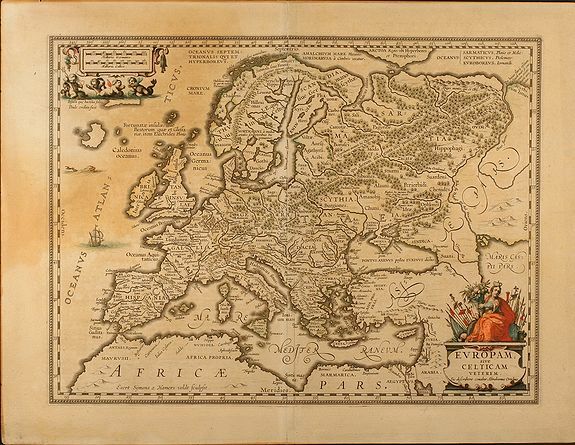 Description :Historical map of Europe, originally attributed to Ortelius also published in Hondius / Mercator Atlas Novus with different catouches. Condition : Overall age toning, top left a bit stronger. Otherwise fine condition.